Whether as pictographs or basic elements of language, Tarot cards form distinct units of meaning. One card may indeed establish a word, two cards may construct a compound word or phrase, and three or more cards may constitute a sentence or sentences. While any one card is easy enough to “translate” in isolation, the challenge is to make sense of the “deep structure” that organizes the several cards of the spread. A secondary system of icons can provide vital clues as to how individual cards relate. That system is our treasury of punctuation marks. Punctuation marks help us to pinpoint the precise structure of the sentences that constitute our life story. Punctuation helps to organize and emphasize the themes at play. It assists us to comprehend the relationships that exist between nouns (the people, places, and things in our lives) and verbs (actions and occurrences). Punctuation can connect, isolate, confirm, limit, regulate, contrast, motivate and animate the flow of information-our intelligence. In other words, punctuation offers cues on how to understand the course of our experiences. A punctuation icon may be drawn randomly from the deck and placed between any two Tarot cards whose relationship is in question. Alternately, one or more punctuation icons may be placed between cards according to the reader’s intuition. With the placement of punctuation, the cards may be read as whole sentences rather than fragments. 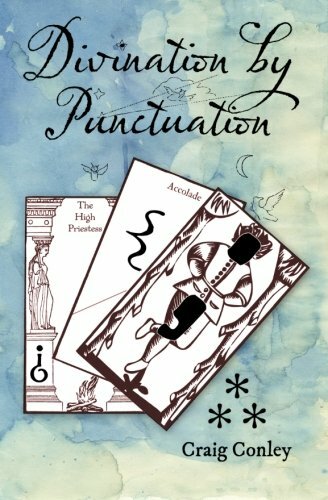 This book oulines a method for placing punctuation in a Tarot spread, describes the meaning of punctuation (in both the upright and reversed cases), presents a Punctuated Tarot system blending punctuation icons with tarot archetypes, and provides six other techniques of Divination by Punctuation.